Champ188 had the most liked content! Bass fishing and golf ... both with my wife and best buddy Donna. For some who may not have been around here long, Edwin is a longtime member who used to post a lot of good information before he sold his bass rig. He is not the enemy. At all. Very, very nice work. Gorgeous fish. Been catching a bunch myself at Beaver. It's a good crappie year for sure. Nice job and thanks for the report. Eagle Rock area? So just how is it that you fail to see an island sticking completely out of the water? And if I'm not mistaken, that one is also marked with a buoy. 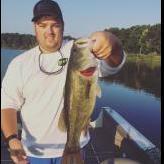 Don't want specific or even general information on where, but were the fish redistributed in every major area of the lake or only near the weigh-in site? Congrats on a nice trip, Jeff. And thanks for the report. 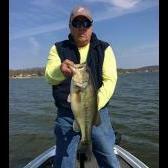 Kentucky angler Dan Morehead caught this 6-12 spot in March 2009 during an FLW tournament on Table Rock. Personally speaking, it's one of the prettiest darn fish I've ever seen. Let's hope he was telling you the truth and not some corporate bullpoop. Aunts Creek sure is a long trip in a pontoon. Now, if Kelly Power at Ulrich Marine supplied the release boat and crew, as he does for some big derbies, you can believe what you were told. I certainly hope that's the case. Indeed, Longball, thanks for the brutally honest report. No one catches them every time and when you have that many boats on the lake, it gets a lot tougher. Unless you camp in one spot all day, you never know if you might be fishing 3 minutes behind another guy who just left the spot you pulled up on. Takes a true fisherman to shamelessly admit failure. Can you share that data with the rest of us? Number of fish released alive … general dispersion of those fish, etc.? And, most importantly, the source of your information? There's been a fair amount of research done on that topic with no conclusive answers, to my knowledge. If I recall correctly, some fish tend to just rehome themselves in their new surroundings while others range wider in search of new digs. But I really doubt any of the fish caught in the upper reaches of the White, Kings or James rivers will ever make it back there. Thanks, Johnny. Love all you do for the sport of fishing.